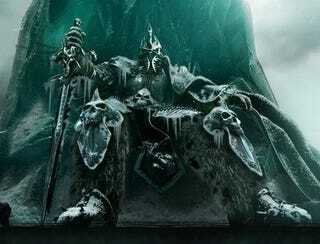 Blizzard have released the specs sheet for their upcoming World of Warcraft expansion, Wrath of the Lich King. And, yes, being World of Warcraft, they're nice and low (though they have been upgraded from previous WoW specs, just a pinch). So low that it feels good typing them here, like we jumped in a way-back machine and set the "TIME" dial to "The Good Old Days". PC users will need a 1.3ghz processor and 512MB/1GB RAM (XP/Vista), while Mac users will need a PowerPC G5 1.6 ghz or Intel Core Duo. Full specs after the jump.